Looking for a Fun DIY (Do It Yourself) activity for the kids this fall, just in time perhaps for Thanksgiving. 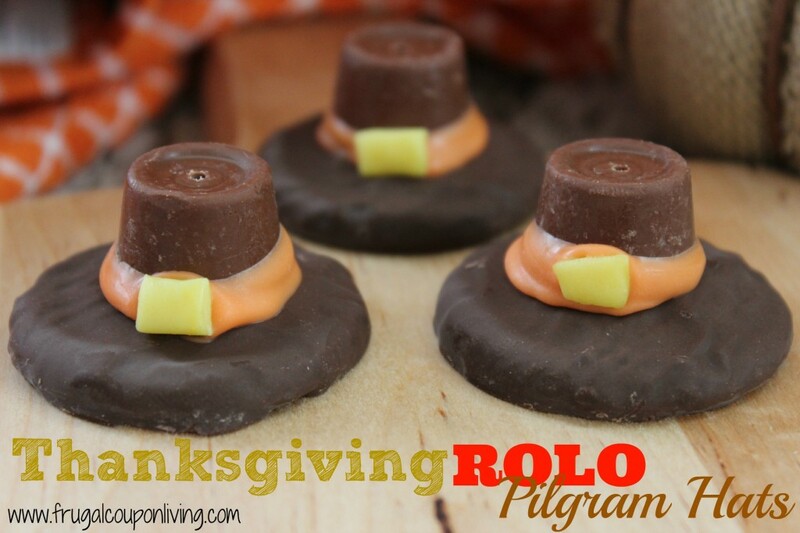 Be sure to PIN this fun Rolo Pilgram Hat Cookie Recipe. Unwrap Starburst and work between fingers to soften and flatten. Cut to create 12 small rectangles to use as buckles for each hat. Heat Orange Candy Chips in large bowl by microwaving for 30 seconds stirring and repeating until melted. Arrange 12 cookies on flat surface. Stick a toothpick in the top of each Rolo. Dip Rolo about halfway down in orange chocolate. Allow excess to drip off. Place Rolo in middle of cookie. Take one of the “buckles” and place along orange “hatband”. Carefully remove toothpicks using a twisting motion. I love that these use Rolo candy instead of Reese cups since my son is allergic to peanuts. I’ve also made these with chocolate coated marshmallows, but this would be easier! So cute, pinned! A-DORE-A-BLE!!!! These remind me of my witches’ hat cupcakes I made for Halloween! Thanks so much for sharing on Totally Tasty Tuesdays! HUGS! These are SOOOOO cute! I love them! Even though my kids are teenagers, they are going to flip over these. So creative! Pinning! I would love for you to come over and link up at Wine’d Down Wednesday if you get a chance (http://www.dizzybusyandhungry.com/wined-down-wednesday-link-party-10/). We party every week from Tuesday evening to late Friday night! Hope to see you there! This is soo cool and easy!!!! Totally doing this! I invite you to link this recipe to my link party http://www.thefamilyfunspot.com/2013/11/bloggers-unidas-1.html Hope to see you there! Have a great day! These are so cute and seem so easy to make. My grandchild would get a kick out of these. Oh my cuteness. I adore these cookies. I may just have to make these and take them to one of Thanksgiving dinners we are going to. Thank you so much for sharing and for linking up to Thrifty Thursday. Your little Pilgram Hat’s are just adorable! Thank you so much for taking the time during this busy season to share your wonderful post with Full Plate Thursday. Have a wonderful weekend and hope to see you again real soon!